The other day a friend called and asked what the story was regarding the man and the alligator on Pope Avenue. 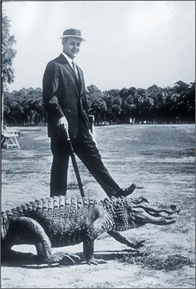 I told him the guy with the cap walking with the gator was Charles Fraser the founder of Sea Pines, and more importantly the man who discovered the present day covenant. I further explained that Charles went to Yale and was being groomed for his families lumbering business, but when he first saw the natural beauty of Hilton Head Island, all bets were off in cutting down any trees for his dad. Who is the statue of a guy walking with the gator on Hilton Head Island? Funny how it worked out, but Charles ended up protecting most of the trees on Hilton Head Island. Remember Dr. Seuss’s story about the Lorax? Charles became the spokesperson for the trees and nature on Hilton Head. Charles wrote covenants & restrictions that included earth tone colored homes so you would focus on the trees, architectural review boards that limited the size of trees a home owner can remove, winding roads that made you see the trees and not the developments, bike paths so we slowed down and enjoyed the trees and he made these restrictions transfer with property to the subsequent owner. Charles was not only a visionary, but in my mind he was the founder of Hilton Head Island. What about the Alligator on Hilton Head? My friend than asked where the alligator came in and I had no clue. I remember my sons climbing on this gator in the Sea Pines Center and I remembered one group of investors that removed it from the Island, but I told him it was probably something to do with living on a sub tropical Island. Turns out I was not far off. When Hilton Head was first starting development, the Saturday Evening Post came to the Island to visit and in March 1962, the magazine published a story about Sea Pines. It included a picture of Fraser, then only 26, walking beside the alligator. That famous picture helped put Hilton Head on the map, and changed this Island forever. You can hug a tree on Hilton Head because of Charles Fraser!